The ISO file format is an excellent file type for data storage and backup, especially suited to backup media like CD's and DVD's. It's compatible with Windows, Macintosh and Linux systems. This file is not only an image of a disc which creates an exact copy of the original physical media, but also can be used to backup an entire hard drive, by imaging the existing drive and then writing the image onto a series of discs. ISO is the abbreviation of International Organization for Standardization. 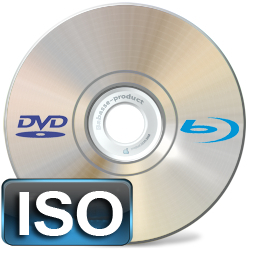 An ISO image extracted from a DVD is a perfect copy of the disc, and can be used to make a replacement of DVD in case the original DVD gets damaged. ISO imaging software is available from several vendors and comes free in some cases. Transfer CD/DVD images over the Internet. An ISO file can be played directly by VLC, MPlayer, KMPlayer, SMplayer and Splayer, etc. Linux-based systems have more options to play an ISO file directly as Linux has a utility called "ffmpeg" that can handle the ISO codec. The other two platforms rely on decompressing the ISO file to extract the data files to be played back. However, almost all the portable media players like iPad Air, Galaxy Tab 4, iPhone 6, Surface Pro/RT are not able to play ISO files directly. You can convert ISO to MP4 first before transferring to device. There are many ways to convert ISO files into other formats. Software can be used to convert the image into either an archive file type or even a media file type depending upon the operating system. In a Linux environment the "ffmpeg" standard can manipulate the ISO image into an archive file type like .bin or even create an .mpg file. In Windows systems software can be obtained for free from the internet to help in conversion. Decompressing an ISO file comprises of extracting data from the image. This is done by using archive software that helps by creating a virtual drive. A virtual drive or "mount-point" is created using an archive manager like "fstab" in Linux systems. Windows systems need to install software such as "PowerISO" to mount the file. Once the image is mounted the data files can be extracted by copying it onto disk.